If you are still thinking about taking the decision of moving to and living in Bahrain in the future, we will give you some assistance to help you settle this issue by displaying 7 unquestionably convincing reasons to make you live in Gulf’s pearl. Let’s start first with humans’ most basic need, which is shelter. 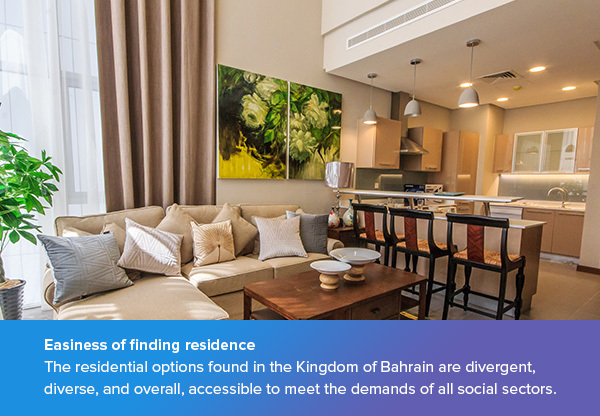 The residential options found in the Kingdom of Bahrain are divergent, diverse, and overall, accessible to meet the demands of all social sectors. Prices for renting apartments in the Bahraini kingdom are among the cheapest between all other GCC states; sales prices also are convenient. Moreover, Bahrain government has opened the door for foreign real estate investors to purchase properties in what is known as freehold areas. Ten years ago, the government defined a number of areas including Durrat Al Bahrain Islands, Amwaj Islands, Juffair area, Seef district, and other vital locations for freehold ownership. The real estate set of regulations acting as the sector’s framework is flexible, it aims at guaranteeing the rights of all contracting parties either owners, tenants, or investors. 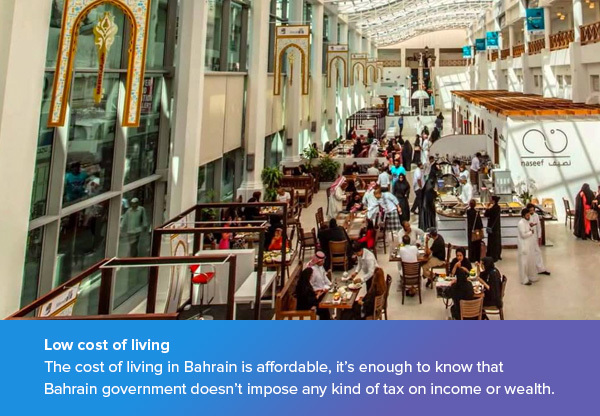 Living in Bahrain is affordable; to find out more about the detailed main costs you might think of, check our article on the cost of living in Bahrain. The government subsidies all substantial commodities to be affordable for all people including gas, meat, and other. The cost of basic services like electricity, water, and internet is also relatively low to make the services accessible to everyone. In another respect, building and construction activities are taking place in full swing all around the kingdom to improve infrastructure, enhance the quality of services offered, and extended roads network. The change happening on Bahrain’s real estate landscape became evident. 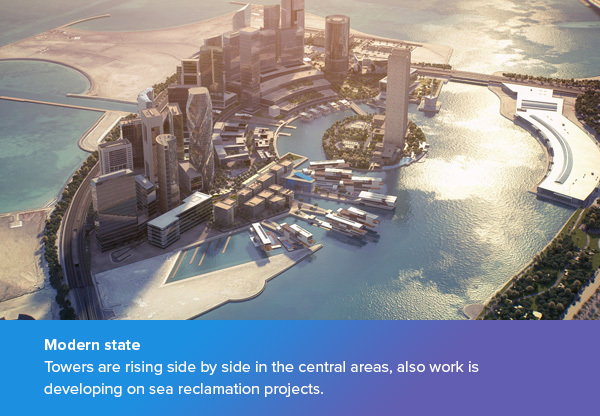 Towers are rising side by side in the central areas, also work is developing on sea reclamation projects like Diyar Al Muharraq islands and other similar developments. Spending a vacation in Bahrain or even staying there during weekends is not a bad choice at all. Here you can do a lot of recreational activities and pass wonderful moments with your friends or family. 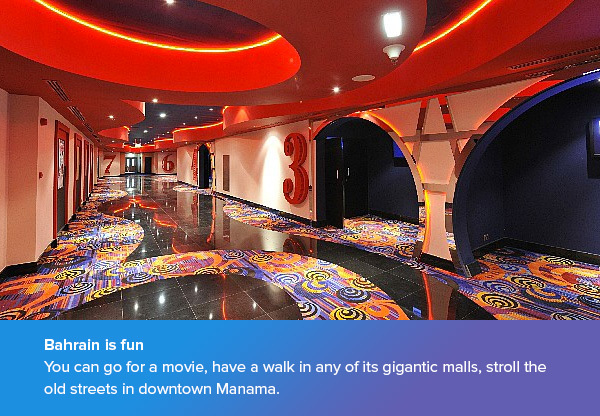 You can go for a movie, have a walk in any of its gigantic malls, stroll the old streets in downtown Manama, visit any of its historical sites or resorts, dive, or eat at any of Bahrain’s magnificent restaurants. Cultural diversity in Bahrain is an attractive point too. As a matter of fact, 45% of Bahrain’s population are expats coming from different countries around the world who enjoy living in Bahrain with total harmony. 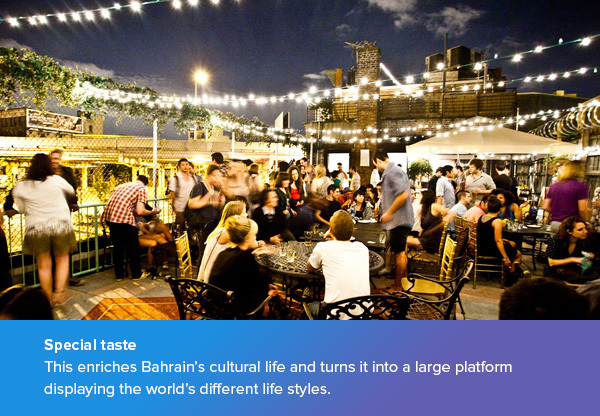 This enriches Bahrain’s cultural life and turns it into a large platform displaying the world’s different life styles. That’s why you can find multiple restaurants boasting different cuisines from America, Asia, Europe, and Arabian food of course, art galleries, culture centers, and a unique state of harmony binding all these cultures together. The kingdom of Bahrain promises very prosperous future for all its residents. The kingdom saw launching many infrastructure and development projects in many areas varying in type between residential, commercial, and recreational projects. The completion of all these projects raised the quality of living in Bahrain and made it more attractive. The kingdom was ranked the top destination for expats to live in 2017, according to a survey conducted by InterNations network. In this ranking, Bahrain surpassed countries like USA, UK, Australia, and other. You will never walk alone in Manama, it’s very easy to find friends. The community is very warm and caring, there are also many activities to do with family members and friends like venturing out in the desert to have a fine grill and sit down around a fire, going to the beach, hitting malls, and many other. You will feel real compassion from the heartwarming conversations in these gatherings, people really care about each other. The small island is a quintessential mixing pot where many nationalities live peacefully together with nothing to differentiate between them.